One of the most startling stories to come out of South East Asia is that of the first mass flight of L-5's over the Hump to Kunming. Long regarded as dangerous for twin-engined transport aircraft, the precipitous mountains which hem the Stilwell Road were recently vanquished by 30 tiny liaison planes. Surprisingly, the nearest the L-5's came to disaster was early in the trip when the first flight, struggling through a blinding rain, ran low on gas 12 miles short of their base. With a ripping of wing tips and snapping of telephone wires, the ten little planes landed on a muddy country road near an unknown Indian village. Reinforced with gas from other ships, 1st Lt. Donald T. Carter of 969 Lexington Avenue, New York City, took off between trees and poles to get help from the base. Meanwhile Major Hawkins, in a commandeered truck, rode to the nearest town where he located a civilian gas dump. Chagrin was a mild word for what he felt when the local police chief informed him that he could not have gasoline without ration coupons. Arriving back at the planes, the pilots were preparing to spend the night in the rain, when through the mud came the gas truck from the airfield. Inside of an hour, the bedraggled L-5's were safely out of the squadron and back at the base. The next day, the wings of the damaged planes were patched and the first flight went on up the Assam valley where new wings were installed. Robert McGovern ready to fly a mission in China. One of the worst parts of the trip was just ahead, the 240 miles run over the 9000 foot Naga Hills. The monsoon was drenching all of North Burma and the weather over the hills was something out of this world. There was only one way to get through contact flying through dense jungle valleys a few feet above the ground. With one eye on the gas gauge and the other on the tree tops the "L" pilots twisted and turned, battling the relentless weather. 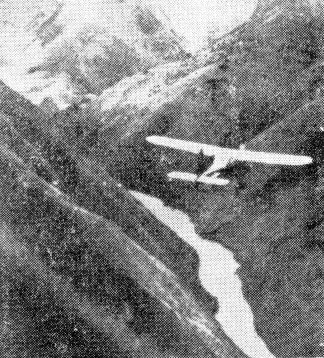 Once over the ridges, it closed in tight and Major Hawkins1 flight was forced to land on an abandoned spur of the Ledo Road. Here, they were fortunate enough to run into a small engineer detachment and a "C" ration lunch. In the afternoon, the weather cleared to 500 feet visibility and the flight went on. All three flights arrived safely at another field and refueled for the flight over the Hump. Among the 30 veteran pilots making this most hazardous light plane flight was S/Sgt. Robert J. McGovern of Langhorne. His wife resides at RFD 2 in Langhorne. For combat in the India Burma theater he holds the DFC and the Air Medal with cluster. Early on the morning of June 16th, Hawkins set off at the head of the grasshoppers on the final lap to Eastern China. The first flight was under Carter and the second 10 were under Lt. John F. Mevins, Corsicana, Texas. But the last flight under Lt. Benedict Lu-kacs of Syracuse, NY, had a harder battle, tougher luck, and narrower escapes. Over the Naga Hills, the engine sputtered and started to miss on the plane piloted by S/Sgt. Robert McGovern of Langhorne, PA. There was a terrible half hour while McGovern struggled to clear the last 9,000-foot ridge, as his flight mates sweated him out. In Northern Burma, the flight's troubles really started. The weather was getting worse every day and it hit the pilots with all its fury on the last leg from Burma to China. One hundred and fifty miles out over the Hump, the planes became separated in a thunderstorm and seven made their way back. The other three were missing. The pilots were M/Sgt. Bill Oldaker of Chattanooga, TN, T/Sgt. John Raynak of Claridge, PA, and S/Sgt. Lee East of Highland Park, IL. Sergeant East radioed; "Lt. Benny, I'm having trouble gaining any altitude and I am going to bail out." Lt. Benny said, "Roger, good luck!" That was the last they heard from Lee. Jungle Air Rescue units began an immediate search the next morning but found nothing. On the 21st, the seven planes made their last, and this time successful, effort to clear the Hump. Fighting storms which whirled the tiny ships like autumn leaves, Lukacs and his men arrived in Kunming. There the flight was amazed and relieved to find two of their missing pilots, M/Sgt. Oldaker and T/Sgt. Raynak, waiting for them. They had bored through successfully on the 18th after the rest of the flight had turned back. S/Sgt. Lee East was given up for lost. Lee East says after he radioed Lt. Benny, he released the door pins on the door and kicked it out. He then fastened his chute harness clip at his chest and hooked up his leg straps, cut the ignition switch on the engine and tried to bail out. It was then he found out his seat belt was still fastened. He unsnapped the leg straps and chest snap to release his safety belt. After he released his seat belt and was again hooking up his chest snap and leg snaps on the chute he broke out into the clear about 800 feet above the ground. Not having enough time to restart the engine, he straightened up the airplane for a forced landing. He was barely straightened up when the airplane clipped the top of a small tree that drove the airplane into a larger tree. Robert McGovern trying to clear the 9000 bridge. Without his safety belt fastened, he left the cockpit seat and went through the windshield, hitting it more with his left shoulder than his head. The fuel line hose connections to the fuel lines running down the tubular braces on each side of the windshield broke loose and he was drenched with fuel. The airplane continued to slide up the side a small hill until it stopped. Lee said he got away as fast as he could as he was afraid it might catch fire. After he felt it was safe to return to the airplane, he removed the First Aid kit and sprinkled sulfa drug on his cut head and arms, then bandaged the cuts as well as he could. He filled his fatigue pant pockets with as much medication supplies as he could that he felt he might need. Lee East continues with his story: I gathered up my Aussie felt hat that had been given to us by the British 14th Army. We had been issued the Aussie hats after a fighter pilot in the 2nd Air Commando Group died of a sun stroke, they were a big help. I found my survival kit that looked like a small canteen, it had chlorine tablets, two treated candy bars, some chewing gum, matches and other handy items. We had also been issued a survival knife. It was about 10 inches long and had a thick razor sharp blade in a leather case we wore strapped to our belt. It had a leather bound handle with a hammer on it that you could crush a coconut or a skull if need be. We always carried a full canteen of water and a 45 automatic with ammo. We carried a carbine rifle in the airplane also in case we went down in enemy territory. My left shoulder was somewhat sore after going through the windshield, but otherwise I was OK. I started off walking in the direction of Kunming and came upon a road. I walked down the road until I came upon an Indian village. Here I got an Indian woman to wash my clothes to get rid of the fuel smell. I ate there and stayed overnight. Next morning I inquired if the village had a telephone, radio contact or telegraph system of some sort. I was informed they had no contact outside the village. After a good breakfast, I bought a can of sardines and started walking down the road again in the direction of Kunming. I had a good supply of water and ate the candy bars at noon. I was quite stiff from the crash, but the longer I walked the more I loosened up. That night I ate my sardines and slept out under the stars. I started out again the next morning. Around noon I got a good shot off at a rabbit and killed him. I skinned him with my survival knife, made a fire and cooked him. Maybe it was because I was so hungry, but the rabbit tasted quite good. I kept what was left of the rabbit and started walking again. Around dusk, I ran into a group of Chinese bandits. They housed and fed me for a few days until they took me to Kunming and out to the military base where my group was. All the fellows in the Hump flight hugged me and slapped my on my back. They were sure I must have been killed when I bailed out. The 30 pilots and their squadrons that made the flight. 127th: T/Sgt. William H. Branan, Jr., T/Sgt. Philip E. Ross, T/Sgt. Cyril Holliday, S/Sgt. Richard Hillstead, S/Sgt. Eaphram A. Nelson, S/Sgt. James A. Casy, S/Sgt. George M. Durner, S/Sgt. Clifford F. Peterson, and S/Sgt. Richard P. Strickhouser. 155th: M/Sgt. John F. Kenfeld, Jr., M/Sgt. William J. Klein, M/Sgt. William Oldaker, M/Sgt. Joseph S. Payne, Jr., T/Sgt. Harry M. Donalson, Jr., T/Sgt. John Raynak, Jr., S/Sgt. Lee E. East, S/Sgt. Cornelius Feyers, and S/Sgt. Robert J. McGovern. 156th: M/Sgt. Thomas Dooley, Jr., S/Sgt. Francis C. Adams, S/Sgt. Melvin N. Chapman, S/Sgt. John I. Krejchik, S/Sgt. John T. O'Keefe, S/Sgt. Hubert E. Fain, S/Sgt. Wilfred R. Jester, S/Sgt. John F. Sanders, and S/Sgt. Cyrus W. Williams. Major William B. Hawkins, Jr., HQ, 2nd Air Commando Group. 1st Lt. Donald L. Carter, 127th -1st Flight Leader. 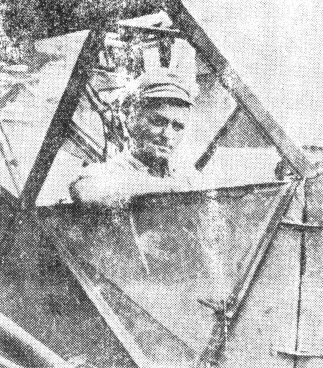 1st Lt. Bennedict Lukacs, 155th - 3rd Flight Leader. 2nd Lt. John F. Nevins, 156th -2nd Flight Leader.